Hammer studios turned to Greek mythology to find the source for The Gorgon. In the small German village of Vandorf, authorities are puzzled by the unexplained deaths of seven people in the past five years. When the girlfriend/model Sascha Cass (Toni Gilpin) of bohemian artist Bruno Heitz (Jeremy Longhurst) is found dead in the woods, suspicions turn to the artist, who is found hanged and disfigured. At a town tribunal, the girl’s father testifies that the artist was taking advantage of his daughter, but Professor Heitz insists that his son was a victim of whatever it is that has been stalking the town for the past few years. Nevertheless judgment is rendered and Bruno is pronounced guilty in the death of Sascha, but Professor Heitz is not satisfied; he vows that he will uncover the truth of what actually happened. Examining the abandoned ruins of a local castle, Heitz is shown getting a glimpse of… something. Whatever it is, it’s horrifying, and with his last breath, Heitz manages to dispatch a letter to his other son Paul, urging that he come immediately and investigate what was the cause of their deaths. 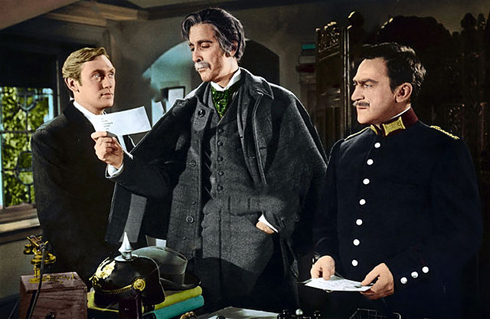 Paul (Richard Pasco) arrives from the University of Leipzig and stays at the home of Dr. Namaroff (Peter Cushing), who runs the local madhouse and is the local coroner. Apparently Dr. Namaroff is regarded as suspicious as well and soon one of his patients is deemed to be the perpetrator of the crimes. But all of the victims have all been turned to stone; how can that be explained? While Paul investigates on his own, he manages to fall in love with Dr. Namaroff’s assistant and love interest Carla Hoffman (Barbara Shelley); surely this will complicate matters. Paul wires his professor of Folklore at the University and so enters Prof. Karl Meister (Christopher Lee) into the picture. Meister does not take no for an answer easily, and immediately creates friction with the law; things are not adding up in his estimation and some more investigation is required. Apparently all the murders have been committed under the light of a full moon and Paul decides to break into Namaroff’s files to find out some history about his latest attraction; it is revealed that Carla was actually a patient of the good doctor’s and suffered from a strange case of amnesia. Meister concludes that the murders are being committed by a human possessed by the spirit of Magaera, one of Medusa’s snake-haired sisters from Greek mythology, thus explaining why the victims were encased in stone. No doubt the audience is wildly nodding their heads in agreement with this wild statement, but hey, it’s a horror film, so logic takes a back seat to plot. I don’t want to reveal the ending, but it is not a stretch to guess who the murderer actually is. The film concludes under the light of a full moon and the nasty apparition appears, the setting is the Castle Borski and the conclusion is hardly the stuff of legend. 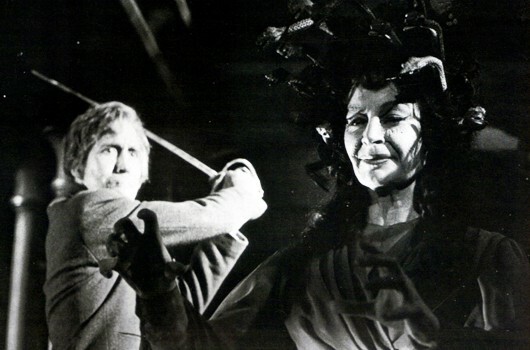 The Gorgon was director Terence Fisher‘s favorite film and Hammer has turned out a splendid product, with the sets looking absolutely amazing and the musical soundtrack adding an eerie element to the overall production. 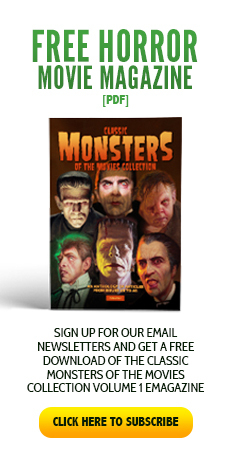 Cast members Lee and Cushing are in fine form as this film re-joins the two since they first appeared in The Mummy (1959), also directed by Fisher. 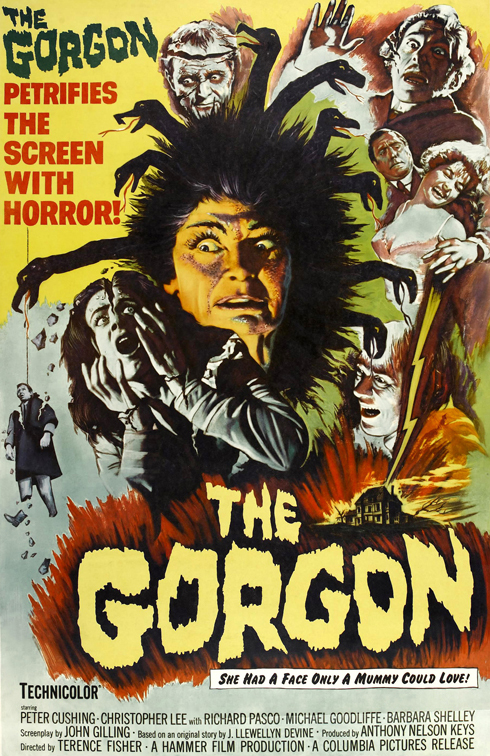 The most obvious disappointment in the film was the appearance of the Gorgon itself, which wasn’t even actress Barbara Shelley, but another woman wearing a ridiculous looking wig of mechanical snakes. The decapitation scene is the climax of the film, but somehow it is bloodless and doesn’t ring true; special effects being what they were in 1964, I guess this is the best that they could come up with. It was rather unique to have a female as the predator and The Gorgon‘s horror is definitely of a feminine nature. 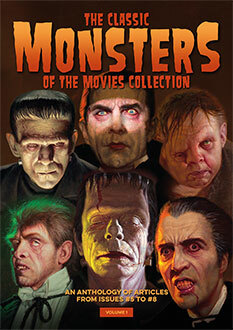 The overall film, though, is effectively entertaining and makes great viewing on a rainy Saturday afternoon.